Essential structural repairs to the park’s conservatory are well underway, but we have just heard from Kirklees Council that they will not now be finished until summer 2019 due to the amount of work needed to the Grade II listed structure. This means both the conservatory and The Park café behind it will be closed for several more months. We know these facilities are much missed, but visitors needing refreshment can find a good selection of hot and cold food & drinks, ice creams and lollies at the popular Café in the Park near the tennis courts. Parking, including disabled spaces, is still available in the Pay and Display car park behind the conservatory which is not affected by the works. 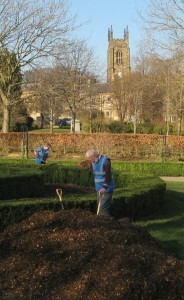 Friends of Greenhead Park gardening volunteers had a real workout in last week’s spring sunshine. 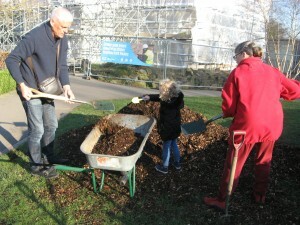 The task on hand was to mulch the herbaceous beds in the Rose Garden with bark chippings provided by the Council’s Forestry section. 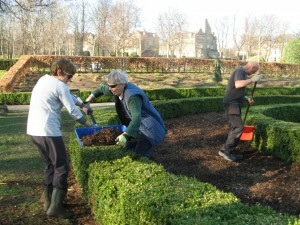 With plenty of effort, mountains of chippings were shifted over the box hedges and spread over the beds – hopefully cutting down the need for future weeding. Our friendly weekly gardening group works alongside gardeners Peter and John on Wednesday afternoons and new recruits are always welcome. 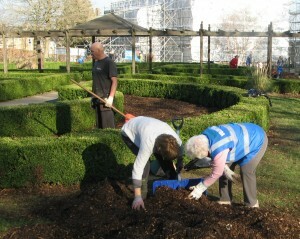 There are opportunities for volunteers to help out at other times too. Just contact us to find out more. 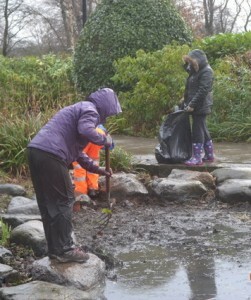 A wet and windy Thursday at the beginning of February saw a hardy group of staff and volunteers getting stuck into improving the environment round the lake. 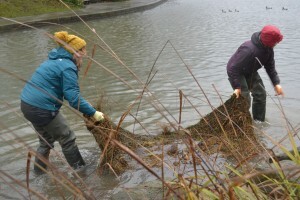 Donning waders and waterproofs, the team installed sections of coir matting pre-planted with native wetland plants round the lake margins to provide shelter for wildlife and improve biodiversity. 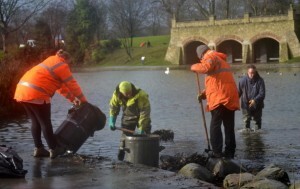 Others took on the mucky task of clearing plastic bags and other rubbish from the lake surrounds. Definitely a job well done! 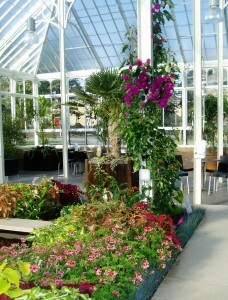 From Monday 26 November until April 2019, Greenhead Park’s conservatory and The Park café are set to close while essential maintenance and repair work takes place. The listed building and café will close after business on Sunday 25 November 2018. 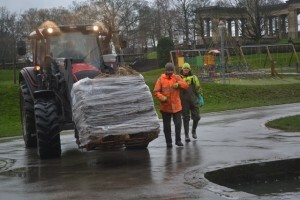 Due to the complex and specialist work involved, Kirklees Council has taken the decision to fully close the whole area – including the new café building at the back – to ensure public safety. 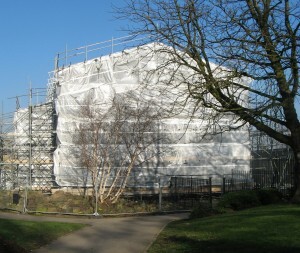 In particular, the glazing and metal structure requires specialist conservation which will involve scaffolding inside and outside of the building. Park visitors will still be able to find refreshments at the Café in the Park in the Refreshment Rooms building by the tennis courts. As usual they will be open throughout the winter from 10am to 3pm. We’ll update you in the New Year on the re-opening dates for the conservatory and The Park café – and a special re-launch party! 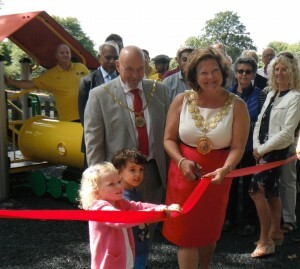 After more than a year of fundraising by the Friends, it was fantastic to see the Mayor of Kirklees, Cllr Gwen Lowe, cutting the ribbon to officially reopen the park’s under 5s play area on Saturday 11 August. 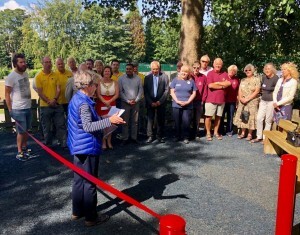 FoGP Chair, Glenis Ireland, welcomed Friends, supporters and representatives from the organisations whose funding had made the makeover possible, and thanked everyone for their part in transforming the play area. As Glenis said at the opening ceremony, we think this project is a great example of what can be achieved by community groups working in partnership with the Council, and is what Friends groups are all about. 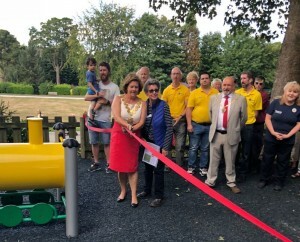 The new equipment is proving very popular with little ones and we’re really pleased to have been able to improve this part of the park with support from all the generous funders and donors. 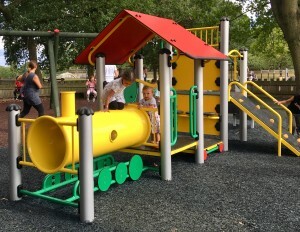 The play train we’ve been fundraising for has now arrived in the toddler play area near the top cafe and, with funds for the train in place, Kirklees Council is carrying out extra work to completely transform what was once a rather dark and neglected area. Surrounding trees have been cut back or removed to allow more light to flood in and the whole area is being resurfaced too. The work should be completed by the end of July and we’re planning an official opening ceremony in mid-August. 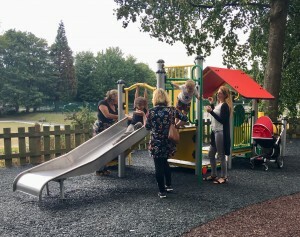 The play area upgrade has been achieved thanks to donations from a host of individual Friends and supporters, plus generous grants from local organisations. 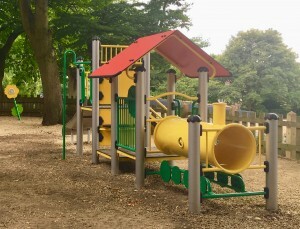 As well as the many individual donors, the Friends of Greenhead Park would like to thank Huddersfield Round Table; the Freemasons of the Province of Yorkshire West Riding; Tesco Bags of Help Scheme; Greenhead Ward Active Citizens Grant Scheme; Huddersfield Rotary Club; Huddersfield Pennine Rotary Club; Huddersfield Lions and Kirklees Council Participatory Budget for their financial support for this project which could not have happened without them. Thanks are also due to everyone who backed our bid to the Tesco Bags of Help Scheme, helping us to scoop the top award of £4,000 by voting for the play train in local Tesco stores. If you fancy a game of tennis in the park, don’t forget to book your court in advance using the on-line court reservation system. It’s free, and you only need to register once, then log in whenever you want to make a booking. You can also book on your phone by downloading the ‘Clubspark – booker’ app. Want to improve your game, or introduce the kids to tennis? The Greenhead Park Tennis for Free scheme offers free coaching for all the family on the tennis courts on Saturday afternoons from 2pm to 3.30pm – sessions are open to anyone of any level and age, and equipment is provided. To book, just register on the Greenhead Park Tennis for Free website. Once you’re registered, you can book yourself and your family members in whenever you want to attend. Tennis coaching specially for children aged 8 to 11 will be on offer during the summer holidays too. Tennis for Kids is a starter course of six high quality sessions introducing tennis to children in a fun and relaxed environment. The course starts on Saturday 28 July, 12.30pm to 1.30pm and finishes on Saturday 1 September. 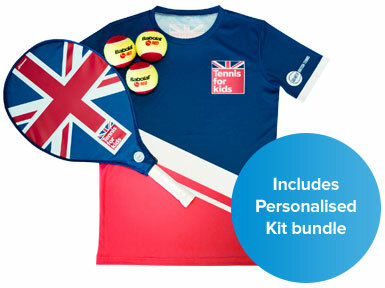 The cost for the 6 week course is £25 including a racquet, ball set and personalised T-shirt. Go to Tennis For Kids for more details and to book a place on the course. And for adults (18+) of all levels who’d like the chance to play in friendly competitive singles matches, there’s a Greenhead Park Tennis League – you can join for just £18 (includes free British Tennis Membership worth £25). To play in the next round – from 19 July to 12 September – you need to sign up by Monday 16 July. 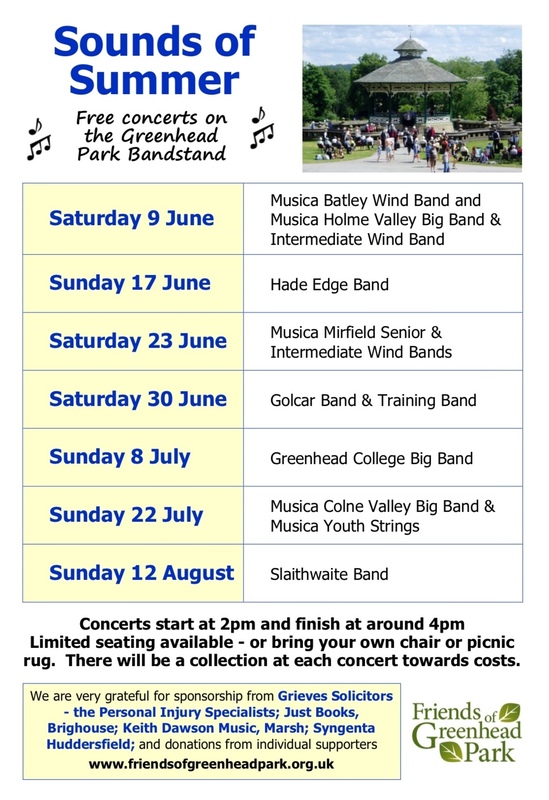 Greenhead Park bandstand will be alive with the sound of music this summer with this great programme of free concerts for everyone to enjoy, brought to you by the Friends of Greenhead Park. So dust off the folding chairs and shake out the picnic rugs ready for Sounds of Summer 2018! 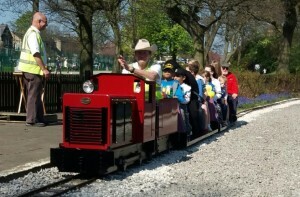 Huddersfield Society of Model Engineers, who run the miniature railway in the park, are kindly supporting us by donating the takings from rides on Easter Monday to our fund for a colourful play train for the toddler play area. The railway’s popular Easter themed rides will be operating from 1pm to 4pm from March 30 to April 2 (weather permitting) – normal fares apply. We’ll also have a Friends of Greenhead Park information stand by the station on April 2 and will be pleased to accept any donations towards the train fund. We are still hoping to scoop the top award from the Tesco Bags of Help initiative. Voting at the main Tesco store in Huddersfield and Express stores in Marsh and Halifax Road is open until the end of April. Please support us when you shop!